Scott Slesinger, Legislative Director of the Natural Resources Defense Council, joined us on Thursday, March 24 to discuss the connection between regulations and the economy, and the need for a better regulatory system. @javits.javits: Hi Scott! Thanks for coming to Cloakroom! It's been a rough few years for environmental legislation. Barring any major shifts in congress, where are you focusing your efforts to gain stronger environmental oversight and protections? Thank you, Javits. Without major changes in Congress, we will push the Administration to follow existing laws & put strong protections in place. For instance, we are working on stronger rules for toxics, a strong Clean Power Plan rule implementation, etc. Congress seems to only get involved when EPA isn't doing their job or there is a screw up. E.g., there were hearings blaming EPA staff for not figuring out earlier that VW changed computer code to cheat energy efficiency standards.We clearly need more compliance and enforcement staff, but Congress has been regularly cutting EPA's budget. Legislative changes to help the environment, as you note, are not in the cards. @sam.ward: Why does everyone always talk in terms of regulation generically? It seems like it's clear we need protections for clean air and clean water, but others push back on overly prescriptive policies. Good question, Sam. The problem is that people talk to you generically because people don't like the concept of regulations. But when you talk about air or drinking water or cigarettes in bars or schools, most people are ok. When someone complains about regs, ask them to be specific. @record318: Hi Scott! In your opinion, is there such thing as "too much" regulations? Reading from your article I agree that regulations can prevent diasters. But what innovations like Uber fighting an entrenched industry? Of course there can be too much regulation. My father ran a bar and he thought closing at 2am and being responsible for drunk drivers was too much. Regulation of economic activity to protect monopolies (cabs, electricity, cable) is very different than regulations trying to address failures of capitalism. I.e. Requiring hospitals to treat emergency patients, or stopping companies from putting their toxic waste down the drain. We think we need regulations because there is not enough incentives in the marketplace for some things such as cutting carbon or, as seen recently, keeping drinking water safe. @sam.ward: Today is the anniversary of ExxonValdez. We've seen BP in the Gulf. Do you think there will ever be the political will to make changes to increase safety of oil transport, stop offshore drilling? Horizon was the first event of its kind that was not followed by stronger Congressional-led requirements. Exxon Valdez led to the Oil Pollution Control Act of 1990. That is the normal situation; we have been having unique Congresses lately. @wee.lumpkin: You say we need a better system. What are two main points you suggest for an improved regulatory system? 1) Get the White House out of the way of the agency regulatory process. They should not be second guessing scientists and experts. 2) Remove redundant reviews that slow down the process. @wee.lumpkin: Obama is getting in the way of EPA regulations? Any recent examples? It isn't really President Obama as much as the structure of the White House Office of Information and Regulatory Affairs. In fact, it is the only office in the Administration the Republican has voted to give more power. @willey.case: Do you expect Obama to go wild with executive authority during this last few months in office to impede fracking and offshore drilling? I think the President will continue to be very careful in using executive authority. The Administration's new 5 year plan was a good example of weighing and balancing competing interests. We have some problems with his plan, particularly dealing with Alaska, and we will be commenting on that during the public comment period. @hawkins: You think environmental regulations are actually good for the economy.. But is that only if the regulatory system isn't broken as it is now? Many regulations are positive for the economy. Regulations requiring energy efficiency have incentivized appliance companies to make better, cheaper & more efficient products, like fridges. I worked for the hazardous incinerator industry. Regulations made them release less pollutants but also gave them the incentive to make their facilities more economical. Our environmental controls industry is now a worldwide leader because the rest of the world also wants a cleaner environment.There is no evidence that there is a conflict between jobs and a better environment. Most regulations have benefits greater than costs. Looking at a rule that costs $200 million is isolation is wrong. Anyone complaining about a regulation needs to look at the benefits. Many arguments against regulations ignore the benefits. @international.u: Speaking of a complicated regulatory system ... For climate, why don't we just push for a carbon price? Simpler than regulating emissions from each industry. Could we get 219 votes for a price on carbon? In theory, the proper price on carbon would be an efficient way to incentivize moving towards a clean carbon energy world. But the key, besides the 219 votes, is the proper price. We are very concerned that the price would be too low and the likely cost getting rid of current regulations would be a net negative. @scott.slesinger: Thank you all for the thought-provoking questions. 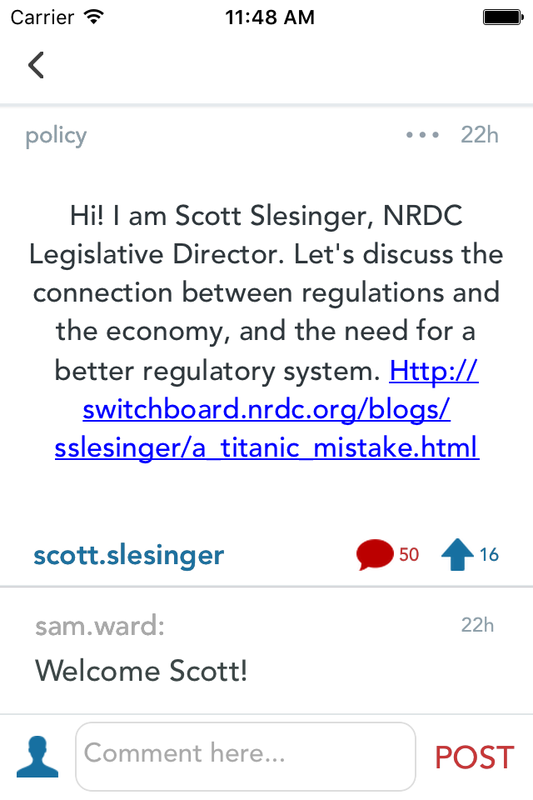 I have to sign-off now, but please feel free to follow me at the NRDC Switchboard. Thank you!